The Times: "Offers incredible reflectivity." The Daily Telegraph: "The film fabric can achieve optimal breathabilty and waterproofing, but is also a reflection innovation"
The Guardian: "During the day it is a rather chic grey garment while at night it transforms itself into a flashing disco jacket. It's the rarest of things - a super visible jacket that doesn't make you stand out like a sore thumb"
The latest jacket to join the best-selling REFLECT360 range that is now sold in over 40 countries, the REFLECT360 CRS (Colour Reflective System) cycling jacket is the world's first cycling jacket that comes in 6 vibrant colours and looks stylish and unassumingly 'normal' by day, but due to our innovative 100% reflective material, it lights up when caught in a vehicle's headlights at night. This jacket takes innovation in the cycling apparel market to a new level. 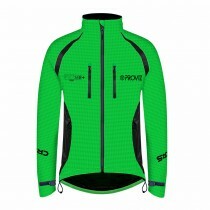 The REFLECT360 CRS cycling jacket incorporates multiple vents - front, shoulder/back and under arm. 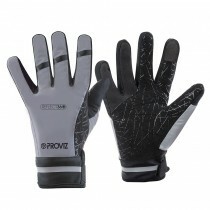 This allows the user to regulate body temperature. By opening the front zipper vents a 'through-flow' is achieved. The air enters the front vents, cools the body and exits via the shoulder/back vents. During the winter, the vents can be closed and are designed to also be used as extra pockets if required. These features enable the jacket to be used all year round. The jacket also has an inside chest pocket and large lower back pocket to store an extra layers or a map. About the fabric: The material has millions of tiny reflective beads embedded in the material so when a vehicle's headlights hit the jacket, the beads reflective the light back to the light source meaning the driver should be able to identify the cyclists further in advance than normal and manoeuvre appropriately. About the fabric: The material has millions of tiny reflective beads embedded in the material so when a vehicle's headlights hit the jacket, the beads reflect the light back to the light source meaning the driver should be able to identify the cyclists further in advance than normal and manouevre appropriately. New for the 2018/2019 season and due to popular demand, we have edited the highly popular REFLECT360 Outdoor jacket, to give you a version with a full-fleece lined interior and hood to help keep you warm in much colder temperatures. 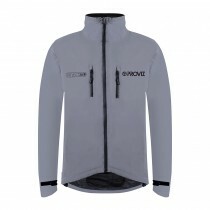 If you are looking for a jacket that keeps you warm and has 360 degree visibility then this jacket is for you as it utilises our famous retro-reflective material to help you be seen more clearly when out on the roads during hours of darkness or poor light. Vehicle headlights reflect off the jacket and back to the original source of light making you appear bright white to a driver. 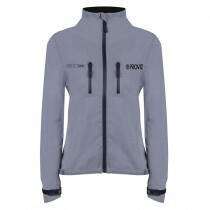 This jacket is perfect for those out on the roads during the winter when it is cold, dark or wet! 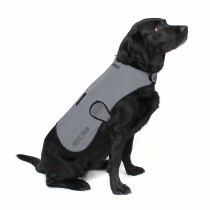 If you are a dog walker then we also have a matching REFLECT360 Dog Coat. 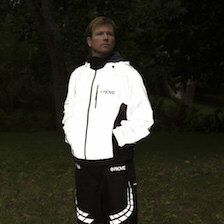 The REFLECT360 Outdoor Jacket is the world's first to be designed using a 100% reflective outer-shell. 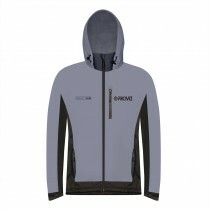 It has exactly the same design as the incredibly popular REFLECT360 cycling jacket but the outdoor version also includes an integrated fold away hood and two side pockets. The jacket's high quality material is designed to look and feel great while keeping the weather out. The reflective capability of the material helps other road users to identify your position on the road at night giving them extra time to react and manoeuvre appropriately. 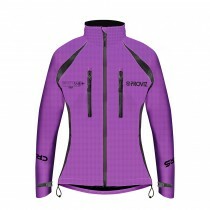 This jacket can be used for multiple activities includiing cycling, walking, hiking, climbing, sailing. If you are a dog owner then we also have a matching REFLECT360 waterproof dog coat so that you and your dog are clearly seen at night. About the fabric: The fabric used for the REFLECT360 range is highly technical. During daylight it is a modest grey colour. At night, when the fabric picks up an external light source, eg vehicle headlights, it gives ‘astonishing reflectivity’ (quote: Cycling Active Magazine ). The material is CE EN 20471 certified. Designed in line with our best-selling Proviz High Visibility Vest, the REFLECT360 running vest utilises 100% reflective material to help you stand out when out for your run. The vest gives you an adjustable size range for men and women to fit most sizes. 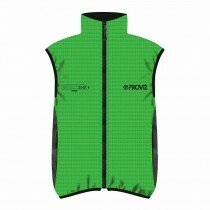 The REFLECT360 vest is an extremely lightweight item to accompany you out on the roads during hours of poor light or darkness as the lightweight reflective material reflects light and therefore you are more easily identified on the road. About the fabric: The fabric used for the REFLECT360 range is highly technical. During daylight it is a modest grey colour. 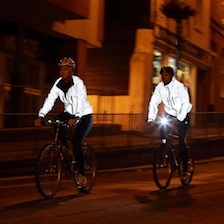 At night, when the fabric picks up an external light source, eg vehicle headlights, it gives ‘astonishing reflectivity’ (quote: Cycling Active Magazine) as it utilises millions of reflective beads that catch the light and reflect it back to the light source helping you be seen further in advance of travelling vehicles. BBC Country File : "These astonishingly reflective coats shine brilliantly in the light of oncoming head lamps"
Daily Telegraph : "As featured in Five of the Best Hi Viz Dog Products." Due to the amazing popularity of the REFLECT360 range for cyclists, runners and walkers, we were asked by many customers if we could design a REFLECT360 waterproof dog coat. We were struck by one email from a customer saying that he was walking his dog at night when his dog slipped his leash and ran in to the road. The owner ran after his dog in to the road and fortunately for the owner he was wearing his own REFLECT360 outdoor coat. According to the drivers of the vehicles stopping in front of him, it was the jacket that saved his dogs life as the drivers saw his jacket reflecting and therefore stopped immediately but could not see the dog. The owner of the dog emailed us the story and asked to design a jacket like his but for his dog....and so we did. The REFLECT360 waterproof dog jacket is 100% reflective and utilises the same material as the rest of the best-selling range. The covers come in 5 sizes for dogs of almost all shapes and sizes and has a harness hole so the dog jacket can go over the top of your dogs harness. During daylight it is a modest grey colour, and at night, when the fabric picks up an external light source eg. vehicle headlights or a torch, it gives astonishing reflectivity so your dog is more easily seen. The REFLECT360 trousers are a rugged, hard-wearing waterproof and breathable trouser designed specifically to ensure you arrive at your destination dry on those wet and windy days. The elements will be kept out yet the breathable fabric will enable heat to escape. Designed specifically for cycling and cut accordingly, the lower leg has a 30cm (size variable) zipper to allow you to quickly get them on/off over your shoes. The zip has a protective waterproof velcro flap to ensure no water can access the zip. An additional velcro adjustable leg band gives you flexibility to ensure no excess material will get caught up in your chain. 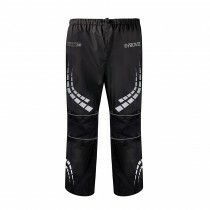 The REFLECT360 range is renowned for its reflective features, so we have given the REFLECT360 waterproof trousers ample two thick stripes at the top (on each leg) and the same on the lower leg ensures lots of reflection at night, but we’ve also added a 5cm thick strip on the lower zip cover along with plenty of extra reflective piping and logos. 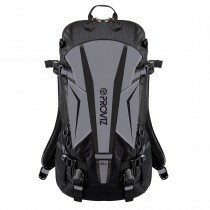 As featured in '220 Triathlon's Three of the best' Running Backpacks. 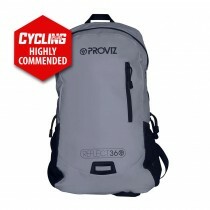 The Proviz REFLECT360 running backpack is designed to be an evolution of our best-selling Reflect360 Backpack, mainly used by cyclists. Runners, hikers and walkers usually require something smaller that moulds to their body and stays secure when under way so we've worked hard to give a different option but without comprimising on the 360 degree reflectivity..
We have designed the running version to be able to carry your essentials to where you need to get to, be it a change of clothes, your lunch or a set of waterproofs! The oversized side straps that each have a zipped pocket to house your valuables that you wish to keep within easy access, come around the side of your body to give a secure and snug fit. 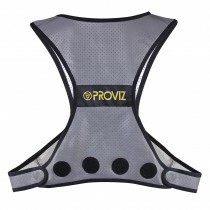 The ventilated back system helps to allow some breathability and airflow while the fully adjustable chest and waist strap give you great flexibility. 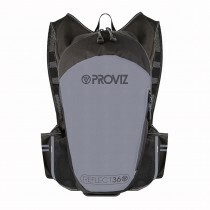 Using 100% CE EN 20471 certified reflective material, the Proviz REFLECT360 rucksack’s millions of integrated reflective beads helps other road users to identify your position on the road at night. The rucksack is hydration bladder compatible for those who wish to use the rucksack on much longer runs and hikes. 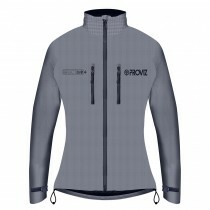 The Proviz REFLECT360 CRS Plus is the merger of two of our best-selling cycling jackets. The Proviz REFLECT360 Plus and the Proviz REFLECT360 CRS (Colour Reflective System) are both fantastic cycling jackets in their own right yet some customers wanted even more. 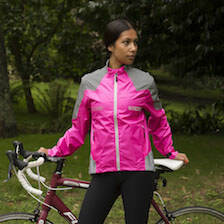 We were asked if we could combine the two jackets to give the best of both cycling jacket to deliver a hybrid. So we have. 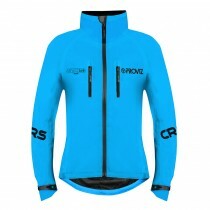 The REFLECT360 CRS Plus is the more technical version of the REFLECT360 CRS jacket which in itself was a unique jacket as it brought the first ever fully reflective jacket to be manufactured in different colours. The REFLECT360 CRS Plus version utilises a highly technical film to ensure higher rates of breathability (10,000/24hr) and waterproofing (10,000 mm), while still delivering the amazing reflectivity that the whole REFLECT360 range has become renowned for across the world. This version of the jacket also has a more tailored fit and added side pockets. The unique lighter weight material we have worked tirelessly on will help those who like to push things a little bit harder, to stay cool. 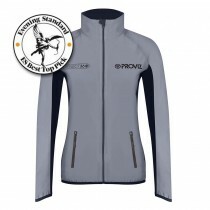 The jacket achieves a great ‘through-flow’ as the front pockets can be opened up and used as vents to allow air in at the chest and it can escape either out of the under arm or shoulder vents. In the colder months the front chest pockets are watertight and the size had been increased to deliver freer hand movement to access your belongings. 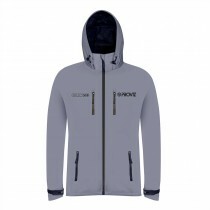 The jacket has also been designed in a two-toned system to give a stylish and sleek look so you can look great out on the roads by day and night. About the fabric: The material has millions of tiny reflective beads embedded in the material so when a vehicle's headlights hit the jacket, the beads reflect the light back to the light source meaning the driver should be able to identify the cyclist further in advance than normal and manoeuvre appropriately. 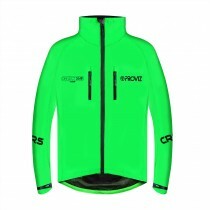 The CRS (Colour Reflective System) fabric combines the best qualities of the REFLECT360 Plus and the REFLECT360 CRS cycling jackets to give a highly technical, fully reflective jacket. Cycling Weekly: "If standing out in traffic at night is 100 per cent your priority then it's best I've seen." 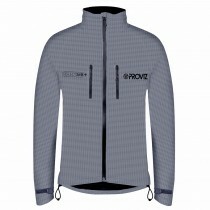 The Proviz REFLECT360 CRS Plus (Colour Reflective System) Cycling Gilet is the newest introduction to the range. It is the first gilet that gives all over reflectivity yet comes in 3 distinct two-tone colours to give you a sleek and fashionable garment and incredible reflectivity by night. The REFLECT360 CRS Plus gilet has been designed to give good breathability (10,000/24hr) and waterproofing (10,000 mm), a tailored fit helps to give a more streamlined look while the two added side pockets help to increase the functionality of the gilet. About the fabric: The material has millions of tiny reflective beads embedded in the material so when a vehicle's headlights hit the gilet, the beads reflect the light back to the light source meaning the driver should be able to identify the cyclist further in advance than normal and manoeuvre appropriately. The REFLECT360 CRS (Colour Reflective System) Plus fabric combines the best qualities of the REFLECT360 Plus and the REFLECT360 CRS fabrics to give a highly technical, fully reflective gilet. 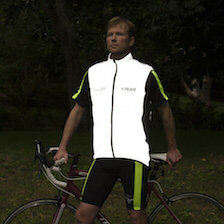 The REFLECT360 CRS Plus (Colour Reflective System) Cycling Gilet is the newest introduction to the range. It is the first gilet that gives all over reflectivity yet comes in 3 distinct two-tone colours to give you a sleek and fashionable garment and incredible reflectivity by night. About the fabric: The material has millions of tiny reflective beads embedded in the material so when a vehicle's headlights hit the gilet, the beads reflective the light back to the light source meaning the driver should be able to identify the cyclists further in advance than normal and manoeuvre appropriately. The REFLECT360 CRS (Colour Reflective System) Plus fabric combines the best qualities of the REFLECT360 Plus and the REFLECT360 CRS fabrics to give a highly technical, fully reflective gilet. This collection is globally renowned. By day the clothing and accessories in the REFLECT360 Collection are a stylish pale grey colour (or if you want to express your individuality the REFLECT360 CRS range provides 6 alternative colours). However, as soon as they are hit by light the reflective beads woven throughout the fabric transform any REFLECT360 wearer into a glowing apparition against the dark night. We challenge you to find any brighter sportswear! For those of you looking for some added functionality, the REFLECT360 Plus range provides more technical versions of the original products. This Collection includes high vis sportswear and accessories designed specifically for cycling, running and other outdoor activities.